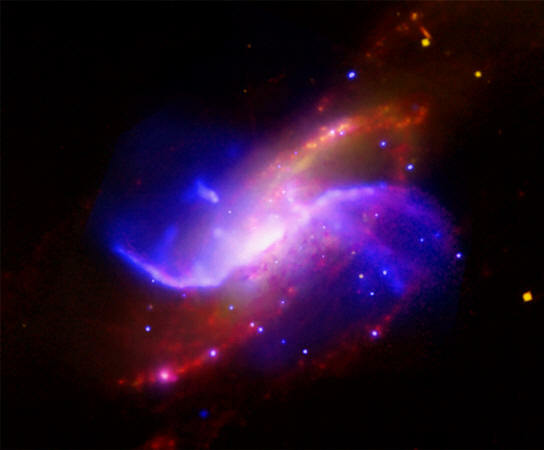 Composite image of spiral galaxy M106 (NGC 4258). Galactic magnetic fields were discovered more than 50 years ago. Astronomers continue to ask basic questions about the stars: what generates their magnetic fields? What gives those fields their shape and their strength? According to a recent press release, a team of astronomers using an updated analytical model of galaxy formation think they have found the answers. Cool gas falling into the galaxy, supernovae explosions, the birth of new stars, and the rotational energy of the galaxy itself are what create the fields. However, they are missing other factors in their equations since the models are not able to predict the fields observed in several spiral galaxies. How do scientists observe extrasolar magnetic fields? George Ellery Hale first plotted the Sun's magnetic field using the "Zeeman effect," or the change in position of Fraunhofer lines found in spectrograms of the Sun. Optical spectra indicate which chemicals can be found in the Sun, as well as other stars. By spreading starlight into its components like a prism does to white light, dark lines at specific places provide a way to determine a star's constituent elements. In the presence of a magnetic field, elements produce spectral lines that split and occupy different positions. Those changes in position are called the Zeeman effect. However, as a paper written by the investigation team states: "Such fields are important in star formation and the physics of cosmic rays, and could also have an effect on galaxy evolution, yet, despite their importance, questions about their origin, evolution and structure remain largely unsolved." It is not surprising that the magnetic field contours surrounding the stars that have been mapped, as well as those seen around galaxies, remain unexplained in the minds of those who hold to a consensus viewpoint. In the theoretical pool of knowledge from which they draw, there are no electrical entities to provide the source for that magnetism. Instead, "star formation reducing turbulent energy," "gas ejection," and "how fast ordered magnetic fields arise from random ones" are discussed. No electromagnetism, no e-fields, and no motor-generator effects are included in their calculations. Magnetic fields in space can be detected more easily than electric currents, so modern astronomers think that the fields are "primordial" fragments left over from the Big Bang. 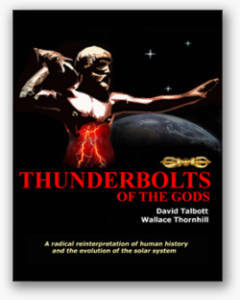 They rely on that conclusion to explain how the structures that make up the Universe were formed. The fact that moving charges constitute an electric current that can generate magnetic fields has been known since the days of Michael Faraday. However, a lack of knowledge often means a lack of vision. As previously stated, moving charged particles constitute an electric current, and that current is wrapped in a magnetic field. When more charged particles accelerate in the same direction, the field gets stronger. That is a familiar idea to electrical engineers, but when astronomers find moving charges in space they are mystified and refer to them as "winds," or "shock waves." Something else not considered when researchers attempt to explain structure in the Universe is that for charged particles to move, they must move in a circuit. Energetic events cannot be explained by local conditions, alone. The effects of an entire circuit must be considered. 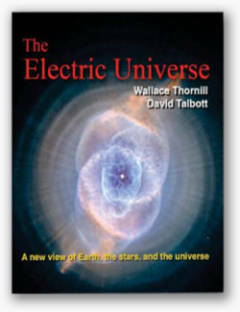 For that reason, while the consensus scientific worldview only permits isolated "islands" in space, the Electric Universe emphasizes connectivity with an electrically active network of "transmission lines" composed of Birkeland current filaments. Filaments expand and explode, throwing off plasma that can accelerate to near light-speed. Jets from opposite poles of a galaxy end in energetic clouds emitting X-ray frequencies. These phenomena are based in plasma science and not gas kinetics, gravity, or particle physics. Astrophysicists see magnetic fields but not the underlying electricity, so they are at a loss to explain them. Astronomers maintain that galaxies are clouds of hydrogen gas and intergalactic dust that were assembled by gravity until they coalesced into glowing thermonuclear fires. The conventional community also proposes that most galaxies contain black holes of unbelievable magnitude. It is those “gravitational point sources” that cause the galaxies to spin, jets of gamma and X-rays that span thousands of light-years to appear, as well as “radio lobes” sometimes larger than the parent galaxy to form. In 1981, Hannes Alfvén said that galaxies are much like one of Michael Faraday's inventions, the homopolar motor. A homopolar motor is driven by magnetic fields induced in a circular conducting plate. The plate is mounted between the poles of an electromagnet, causing it to spin at a rate proportional to the input current. Galaxies move within a filamentary circuit of electricity that flows through the cosmos from beginning to end. We see the effects of those electromagnetic fields that permeate space. Electricity organizes itself within masses of plasma sometimes larger than galaxy clusters. That plasma is primarily composed of neutral atoms, but free electrons, protons and other charged particles are also present. 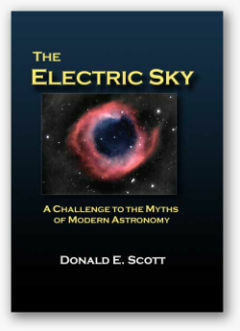 Primal electrical energy is orders of magnitude more powerful than gravity. The “plasma ropes” that comprise Birkeland currents attract one another over distance in a linear relationship, so Birkeland currents are the most powerful long-range attractors in the Universe. Electric currents flowing through dusty plasma sustain the magnetic fields detected in stars and galaxies.